Wedding invitations set the tone for your entire big day so if you're going with a Gothic themed wedding you'll need a gorgeous Gothic wedding invitation to make that announcement. The Vampire Bride wedding invitation is a deliciously dark looking Gothic Wedding invite. The dark red with the black damask pattern is, quite simply gorgeous. This particular wedding invitation is a 5.25" square invitation that is available on six different paper types all of which are high quality. The damask pattern works beautifully with a Victorian inspired Gothic wedding, the Vampire Bride name is simply added because it brings to mind the imagery of the traditional Victorian Vampires that are well known in pop culture. The great thing about this wedding invitation is that it's only one small part of a matching range of wedding stationery from postage stamps to table cards and more - you can even get this design on a photo wedding invitation if you'd like to add your photo to your invite. I would recommend getting a black and white photograph taken if you want to really add an extra element to this Gothic invitation. Carrying on with the black and red color scheme this wedding invitation isn't quite so intense in color and yet the pattern is very Gothic in style. This design is also available on a range of other pieces of wedding stationery. The opulence and glamour that a chandelier represents is very in keeping with a romantic Goth which makes this a great wedding invitation. It's a simple black and white color scheme which means that you can use this as your wedding stationery if you're still not sure what (if any) other color you might want to add into your wedding color scheme. If you want to add a little red to this invitation then a great idea is to add some red rose petals (artificial ones that is) inside of the envelope that you send your wedding invites in so that they fall out as people pull out the invitation. Red roses are very romantic which makes them ideal for a romantic Goth wedding. This design is called the Grand Ballroom by the designer and is also available on a range of wedding products including postage stamps - it's really cool to match your postage stamps with your wedding invitations - table numbers and even wine bottle labels if you want to give away bottles of wine as your wedding favors. 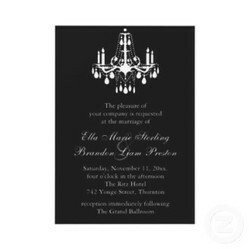 In this same shop there is also a similar design which has a black on black damask background to the chandelier - this would also be a great choice in wedding invitations, but it's not on such a wide range of products. This dark wedding invitation is a Victorian inspired Gothic wedding invite. The soft light from the candles in the candelabra are nicely reflected in a heavily ornate silver mirror. Can this offer anything other than a Gothic atmosphere? It's certainly a very unique wedding invitation design and frankly what can be more romantic than candlelight? This design is available on a number of other wedding stationery items as well and will certainly set the stage for an incredibly romantic Gothic wedding to come. Purple and black is another intensely Gothic color combination and this wedding invitation allows you to personalize your own Gothic wedding invite. Simply upload your photo and you have a personal yet Gothic invitation which looks sensational. Although the photo on this image is actually a colored one I think a black and white photograph or perhaps a sepia toned one would look even better on the invitation. This range of Gothic wedding stationery is available on a range of products including bridal shower invitations, wedding binder and thank you cards. Here's a selection of more purple Gothic wedding invitations which include the cool purple and black color combination along with purple and silver. I'm sure that at least one of these styles will appeal if you're thinking of purple as your wedding color. Green is another color that can be used really well in a Gothic wedding. Shades of emerald with black are great for the more traditional sub-genres of Goth whereas bright, neon shades of green work really well for a Cyber Goth Wedding. I love the way the Gothic wedding invitation above is accented by green, it's a very effective way of adding a hint of green to the invitation while still keeping it a little dark. The very Medieval style cross looks great with a fleur de lis style on it's points and the Celtic symbolism is also embraced by many Goths. This design is available on a range of different pieces of wedding stationery from the invitation to table numbers, wedding stickers and more. A number of vintage style wedding invitations also work really well with a Gothic wedding and I think these next few wedding invitations combine the vintage style with a Gothic style really well - what do you think? As you can see there are so many different ideas for Gothic wedding invitations that it's hard to know where to start, but hopefully this page has helped you a bit.